Xander is an Imperial nightblade who lives aboard the ship, the Red Wave. He used to be the captain of a ship known as the Argent Raptor, but now he is just a lowly crewman for Safia. Xander wears a set of fine clothes with a matching pair of boots. He carries a selection of upper-class loot and gold along with an additional small amount of gold. He wields a leveled one handed weapon, which can be up to elven in quality. Xander will happily tell you about his days of being the captain of a ship: "I once captained a ship called the Argent Raptor. She struck an iceberg and went down, just north of Windhelm." He will also tell you about his love of fine clothes: "My shipmates scoff at my love of finery, but I know envy when I hear it." He may also complain to you about how he has fallen from his days of being a captain: "From ship's captain to lowly crewman... I suppose I deserve it after wasting all my coin on gambling and women." 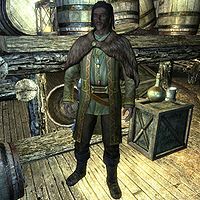 Xander will also reveal to you where he used to live until he ran into some legal issues: "I hail from Cyrodiil, but after a... misunderstanding with the law, I needed a swift change of scenery." Angeline: "Back so soon Xander?" Xander: "Can you make some new poultices for my...you know?" Angeline: "You should be more careful about the women you spend time with in port. Come back later and it will be ready." Xander: "My tunic is fading. Too much sun and salt spray." Taarie: "I doubt it can be repaired. You'll have to buy a new one." Xander: "I need some things for the ship." Sayma: "If you give me a list, I'll have them delivered to the dock by tomorrow morning." This page was last modified on 30 May 2014, at 22:48.